The unobtrusive monitoring of individuals with in-home sensors provides useful embedded health assessment, i.e., the continuous assessment of health changes based on each person’s individual activity patterns and baseline health conditions and thus, can improve health outcomes. Early detection of health changes is the key to maintaining health, independence, and function. This project leverages ongoing work at the University of Missouri in the use of sensor technology for embedded health assessment. Sensor networks have been deployed in the homes of older adults in TigerPlace, an eldercare facility near the University of Missouri (MU) campus in Columbia, Missouri. In this project, we test the concept in senior housing in Cedar Falls, Iowa, using in-home sensors and remote video conferencing for the nurse care coordination. Fiber networking in Columbia and Cedar Falls will provide the bandwidth and latency essential for this approach. Previous system development is utilized and a new hydraulic bed sensor has been integrated. The sensor configuration also includes the team’s previous work with the Kinect depth images for extracting gait parameters of residents in the home. Integrate a new hydraulic bed sensor which captures quantitative pulse, respiration, and restlessness into the Health Alert System. Deploy and test the Health Alert System in remote senior housing, using high speed video conferencing for nurse care coordination. Evaluate the usability and effectiveness of the remote Health Alert System for managing chronic health conditions. In-home sensors hold enormous potential for identifying early changes in health. The proposed project addresses the US Ignite vision of using flexible, high speed, low latency networking to solve real-world problems. Testing the health alert system at a remote site from the healthcare providers provides important information about how the approach scales up into other settings with high speed video conferencing and transfer of sensor data. This is an important next step towards moving the approach into independent housing where seniors want to be. 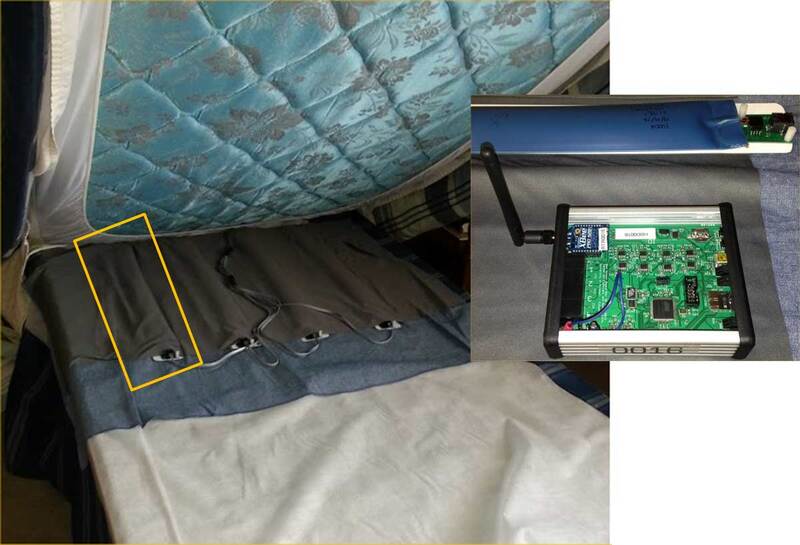 An embedded system was designed, developed, and tested for the MU hydraulic bed sensor, which captures ballistocardiogram (heart) and respiration signals as well as restlessness in the bed, while positioned under the mattress. Health change alerts were generated automatically and sent to the clinical staff. We also investigated the use of video conferencing for nurse care coordination. Figure 1. The hydraulic bed sensor is positioned under the mattress with four transducers, to capture quantitative heart rate, respiration rate, and bed restlessness passively and without contact. An embedded system was developed in this project to allow deployment in the home. Figure 2. A ten-second signal from a bed sensor transducer. The high amplitude and low frequency component is the respiration signal. The low amplitude and high frequency component is the ballistocardiogram (cardiac) signal. Sheahen M and Skubic M. “Design and Usability of a Smart Home Sensor Data Unser Interface for Clinical and Research Audience,” Proceedings, 2014 Conference on Smart Homes and Health Telematics, Denver, June, 2014. Heise D, Rosales L, Sheahen M, Su BY & Skubic M, “Non-Invasive Measurement of Heartbeat with a Hydraulic Bed Sensor: Progress, Challenges, and Opportunities,” Proceedings, 2013 IEEE International Instrumentation & Measurement Technical Conference, Minneapolis MN, May 6-9, 2013. Rosales L, Skubic M, Heise D, Devaney MJ & Schaumburg M, “Heartbeat Detection from a Hydraulic Bed Sensor Using a Clustering Approach ,” Proceedings, 34th Annual International Conference of the IEEE Engineering in Medicine and Biology Society, San Diego CA, August 28-September 1, 2012, pp 2383-2387. Su BY, Ho KC, Skubic M & Rosales L, “Pulse Rate Estimation Using Hydraulic Bed Sensor,” Proceedings, 34th Annual International Conference of the IEEE Engineering in Medicine and Biology Society, San Diego CA, August 28-September 1, 2012, pp 2587-2590.